Washington Metropolitan Area Transportation Authority (Metro) received an increased capital commitment of $75 million from Maryland Gov. Martin O'Malley, Virginia Gov. Terry McAuliffe and District of Columbia Mayor Vincent C. Gray. Metro GM/CEO Richard Sarles said that the funding marked an important down payment toward Metro's "Momentum" strategic plan to reduce crowding and add system capacity. "Thanks to the strong leadership of Mayor Gray and Governors O'Malley and McAuliffe, we can continue our rebuilding efforts and lay the foundation for all eight-car trains, with power upgrades, Union Station and Gallery Place station expansion designs, and buses for priority corridors," he added. Momentum, Metro's strategic plan, builds on the Metro Forward capital program, which is rebuilding the system and making key safety and reliability improvements, according to Metro. The strategic plan addresses growing crowding and outlines near-term goals for 2025 along with the steps that Metro must take to prepare for coming regional population and economic growth. The plan also ensures that Metro never returns to a time when the system's tracks, escalators, trains and buses are not maintained to today's safety and reliability standards. For riders, Momentum will mean more trains; reduced crowding; faster buses; brighter, safer, easier-to-navigate Metrorail stations; and improved customer information systems. The Metro board unanimously approved the Momentum strategic plan in June 2013. Since then, Metro board members, stakeholders and senior managers, partnering with business community leaders and transit advocates, have been working to inform and build support from riders, organizations, jurisdictions and regional employers. Today, more than 60 organizations and more than 2,000 individuals have endorsed the Momentum plan. 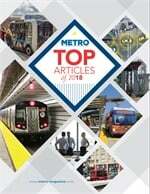 According to the transit system, riders and stakeholders have said overwhelmingly that increasing capacity with eight-car train service is the most important investment priority for Metro. Washington, D.C.’s plans for streetcars to provide another critical transit link. During rush hours, thousands of passengers will transfer between Metrorail and Maryland’s Purple Line, adding even more riders to the Red Line. Roughly $18 billion worth of investment is planned or proposed for Tysons near Silver Line stops. That growth must not be limited by rail congestion in the downtown core of the Metrorail system. Adding buses to busy corridors, along with bus-priority lanes and traffic signal priority for buses, will enable Metro to better compete with cars on the road and meet the growing ridership which is being driven by young adults moving into the region. Maryland is making significant investments in areas beyond where Red Line trains “turn back.” These areas will require eight-car trains and more rush hour capacity in order to reach their full potential.